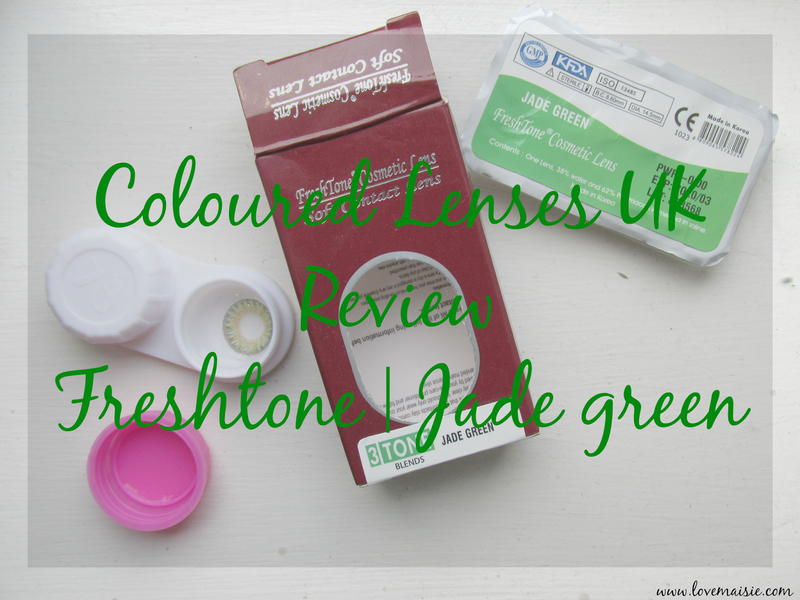 When the guys over at Coloured Lenses UK got in touch and offered to let me try out a pair of their coloured contacts, I was so super excited! I have blue eyes that often appear different shades depending on the light, my eyes are super sensitive to light, seriously in the summer, if I forget my sunglasses i’m basically screwed all day. 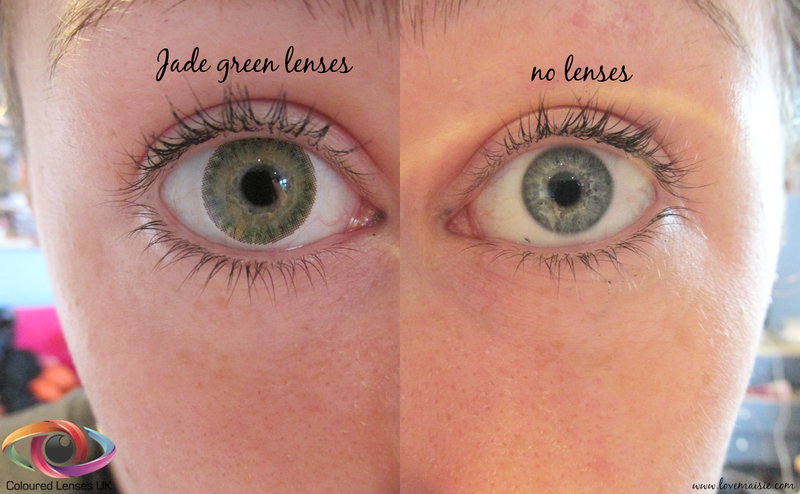 I chose to trial the freshtone jade green contact lenses as I’ve always thought that green eyes were so stunning! The contacts arrived individually packaged in a one-time use cleaning solution(so you will need to buy a bottle of cleaning solution to re use them) along with a handy little case to store them, as seen above. These contact lenses are not prescription and are solely for aesthetic use. Coloured Lenses UK do not currently stock prescription coloured contacts but are in the process of adding this option to their website! I’d applied contact lenses on myself once, many moons ago, so I was a little nervous about applying these for the first time, but I surprised myself and i’m now pretty pro at the whole shoving something onto your eyeball activity. The FreshTone jade green pair that I chose are made up of three different tones to make for a more natural looking colour. If you know a thing or two about contact lenses and are after the nitty gritty details then here you go: diameter: 14.5mm base curve: 8.6mm water percentage: 38%. These babies can be worn for up to a month, providing that you clean and store them in some contact lens solution like this one available from boots. I am so so pleased with how my lenses look and feel! As you can see above, my eye colour is completely transformed to this beautiful jade green shade and they look pretty damn natural too! These lenses don’t impair my vision at all and I can’t even feel them on my eyes, it’s amazing! I’m pretty impressed to say the least! The size of the lens is slightly larger than my iris but I think this makes for a cuter look, do you know what I mean? Sort of like how Vsauce explains cute? But natural looking all the same! Coloured Lenses UK have a huge selection of different coloured contacts ranging from violet to sterling grey and pure hazel to ocean blue! Whether you fancy a change or you need that pair of brightly coloured lenses to complete your fancy dress costume, Coloured Lenses UK is deffo your place to go! Click here to shop two pairs of FreshTone lenses for just £19.99! They also offer free shipping on orders over £20! Let me know if you’ve tried these lenses out before or if you’re now going to be making a purchase! *Disclaimer: Although this items was gifted to me by the above company, all opinions on the product are 100% honest and of my own and are not representative of the company. I would never give a false/misleading review of a product, no matter what relationship I have with the company.